Ocean Life Education had the rare opportunity to take the Ocean to the Outback this week, as part of a funding program supported by the State Government initiative, Advancing Queensland. 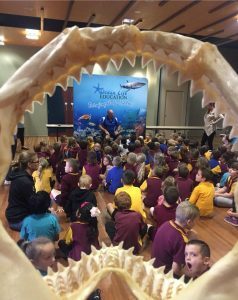 Children in Jandowae, Chinchilla and Dalby were excited to meet our amazing sea creatures which many had never seen before. As usual, the sea stars proved a big hit, as too did the colourful tropical sea cucumbers with their vibrant coats and super soft bellies. Bob the banded bamboo shark made an appearance at every show, but he’s not really the touchy feely sort so he prefers the sanctuary of his clear tub. The logistics were huge to move the animals far from their natural environment. A truck was hired, 1000 litres of sea water was stored and carried along with pumps and filtration systems. But all the hard work and effort involved was well and truly worth it according to Ocean Life’s Director of Education, Richard Coward. And how did the animals react to such a long road journey? But the inland adventures are not over yet – Richard will be heading to Gayndah next month to help a whole new audience fall in love with his colourful array of creatures and become champions of the sea – even if it is from afar! This entry was posted in Uncategorized on October 19, 2017 by oceanlifeeducation.